I have written here at length about Canadian banks and how the world impression that they are industry leading in strength is at best coloured by superb behind the scenes co-operation between the banks, the government and the Bank of Canada. The biggest example I could write about was the 2008 freeze on interbank and inter institutions derivatives hastily forced on the banks in 2008. Purdy Crawford/ Pan Canadian Investments: The Canadian government did presciently freeze $35 billion in derivatives back in 2007. But if you flip through the Canadian Banks search on this blog there is a general theme that Canada’s banks are not materially better capitalised than other banks in the world. And now we have the ammunition many of us knew existed but had no evidence. Todays bombshell from the Canadian Centre for Policy Alternatives, authored by chief Economist David McDonald, provides clear evidence of the extent of Government assistance to the Canadian banks during the crisis. The amount of that assistance is $114bn. 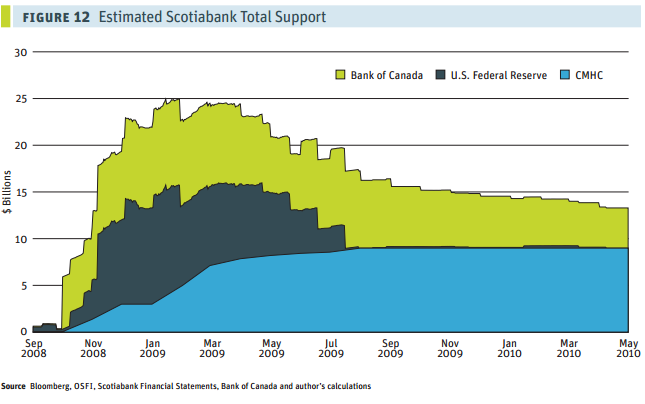 This is several times total Canadian Bank equity. The official story of the 2008 financial crisis goes like this: American and international banks got caught placing bad bets on U.S. mortgages and had to be bailed out. But not in Canada. Through the financial crisis, Canadian banks were touted by the federal government and the banks themselves as being much more stable than other countries’ big banks. 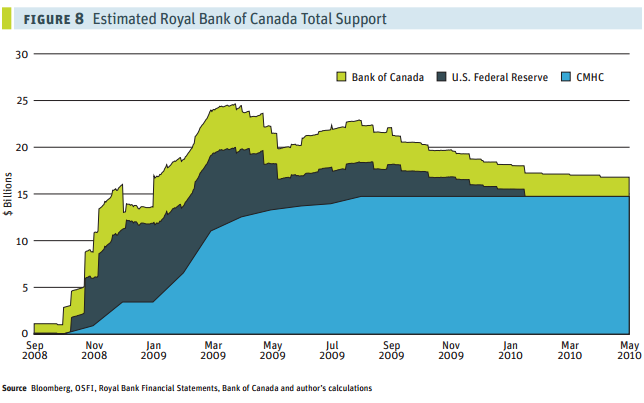 Canadian banks, we were assured, needed no such bailout. However, in contrast to the official story Canada’s banks received $114 billion in cash and loan support between September 2008 and August 2010. They were double-dipping in not only two but three separate support programs, one of them American. They continued receiving this support for a protracted period while at the same time reaping considerable profits and providing raises to their cE Os, who were already among Canada’s highest paid. 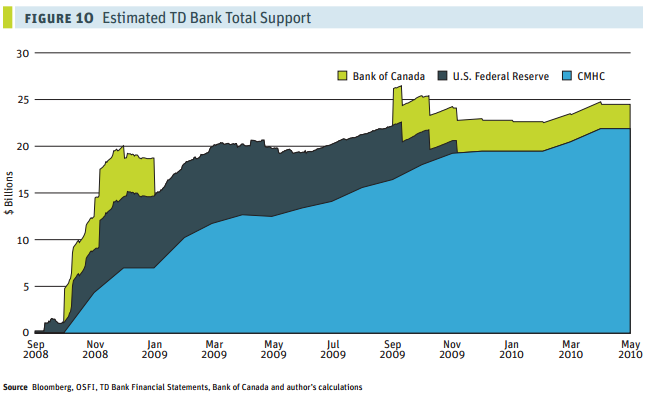 In fact, several banks drew government support whose value exceeded the bank’s actual value. Canadian banks were in hot water during the crisis and the Canadian government has remained resolutely secretive about the details. 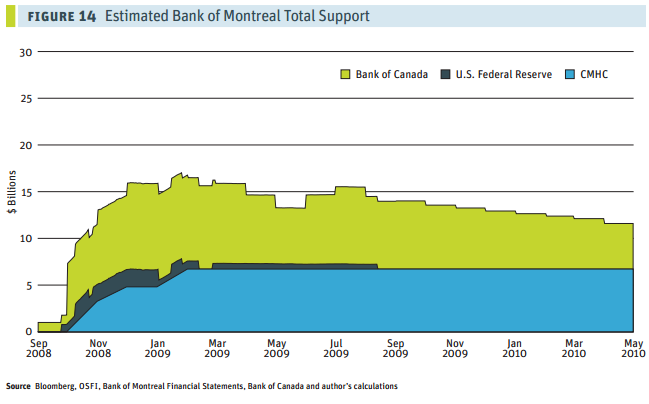 The first point of interest in the report is the extent of support as a percentage of the banks’ market capitalisation. This one should be read in the context of the high leverage that banks enjoy courtesy of government support through deposit insurance and liquidity advances from the Bank of Canada on a day to day basis. 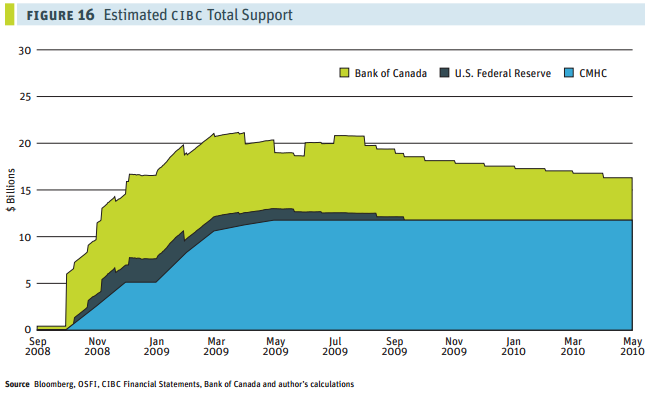 have taken less money to have simply bought all the shares in CIBC instead of providing it with support. To top it off, the CEO of each of Canada’s big banks ranked among the highest paid 100 CEOs of Canada’s public companies and at the height of government support between 2008 and 2009 each CEO of each bank received raises in total compensation. For instance, Edmund Clark of TD Bank saw his overall compensation jump from $11.1 million in 2008 to $15.2 million in 2009. 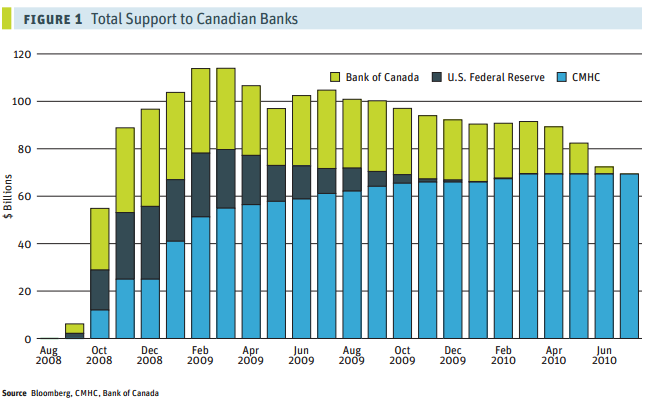 The total support to Canadian banks and the surprise that CMHC was the primary conduit. A healthy financial system cannot be based on massive government support for which the details remain secret. It is only through an honest and transparent examination of what occurred and how it can avoided in the future that a stronger financial system can be built, which is in everyone’s best interest. This is a stellar piece of work and probably the best report on the Canadian bank system of the 2008 banking crisis. Recommended reading for anyone interested in banking and how it really works. There is no magic Canadian bullet.